SBM Vibrating screen can separate the silica sand very well. It moves round, has multi-layers and is of high efficiency. Washing is the simplest and lowest cost method of cleaning silica sand. In some of the very pure deposits that are void of heavy minerals, high amounts of clay and silt, and no surface staining, washing is sufficient to produce acceptable grade product. The eccentric shaft vibration exciter and partial block help to adjust amplitude. The material drops down along the long line. In screen grading, the material is separated mechanically on screen plates. In the washing process, water is added to the sand and is generally pumped to a cyclone for desliming. The movement of the slurry passing through the pump and pipeline is sufficient to loosen the small amount of fines or clay that are in the ore body. Once the minor amounts of fines or clay have been released from the silica sand they can be removed via a variety of methods. 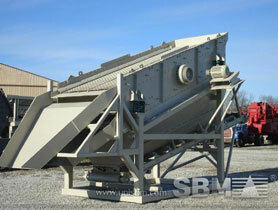 "Vibrating screener from SBM really helped us solve some problems we met before. We trust the products of SBM!"